The domain within your query sequence starts at position 307 and ends at position 386; the E-value for the SWIB domain shown below is 1.3e-21. The SWI/SNF family of complexes, which are conserved from yeast to humans, are ATP-dependent chromatin-remodelling proteins that facilitate transcription activation [(PUBMED:11147808)]. 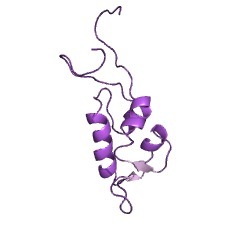 The mammalian complexes are made up of 9-12 proteins called BAFs (BRG1-associated factors). The BAF60 family have at least three members: BAF60a, which is ubiquitous, BAF60b and BAF60c, which are expressed in muscle and pancreatic tissues, respectively. 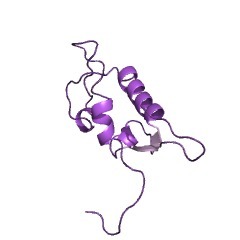 BAF60b is present in alternative forms of the SWI/SNF complex, including complex B (SWIB), which lacks BAF60a. The SWIB domain is a conserved region found within the BAF60b proteins [(PUBMED:12016060)], and can be found fused to the C terminus of DNA topoisomerase in Chlamydia. There are 5075 SWIB domains in 4496 proteins in SMART's nrdb database. Taxonomic distribution of proteins containing SWIB domain. This tree includes only several representative species. The complete taxonomic breakdown of all proteins with SWIB domain is also avaliable. Click on the protein counts, or double click on taxonomic names to display all proteins containing SWIB domain in the selected taxonomic class. Diversity and specialization of mammalian SWI/SNF complexes. The SWI/SNF complex in yeast facilitates the function of transcriptional activators by opposing chromatin-dependent repression of transcription. We demonstrate that in mammals SWI/SNF complexes are present in multiple forms made up of 9-12 proteins that we refer to as BRG1-associated factors (BAFs) ranging from 47 to 250 kD. We have isolated cDNAs for human BAF155, BAF170, and BAF60. BAF155 and BAF170 are encoded by separate genes that are both homologs of yeast SWI3. Both contain a region of similarity to the DNA binding domain of myb, but lack the basic residues known to be necessary for interaction with DNA. The two SWI3 homologs copurify on antibody columns specific for either BAF155 or BAF170, indicating that they are in the same complex. BAF60 is encoded by a novel gene family. An open reading frame from yeast, which is highly homologous, encodes the previously uncharacterized 73-kD subunit of the yeast SWI/SNF complex required for transcriptional activation by the glucocorticoid receptor (Cairns et al., this issue). BAF60a is expressed in all tissues examined, whereas BAF60b and BAF60c are expressed preferentially in muscle and pancreas, respectively. 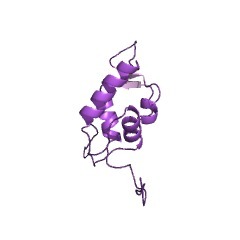 BAF60a is present within the 2000-kD BRG1 complex, whereas BAF60b is in a distinct complex that shares some but not all subunits with the BRG1 complex. The observed similarity between mammalian BAF190, BAF170, BAF155, BAF60, and BAF47 and yeast SNF2/SWI2, SWI3, SWI3, SWP73, and SNF5, respectively, underscores the similarity of the mammalian and yeast complexes. However, the complexes in mammals are more diverse than the SWI/SNF complex in yeast and are likely dedicated to developmentally distinct functions.